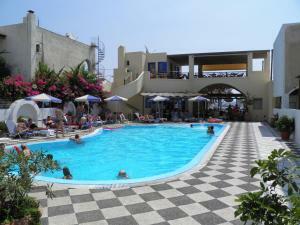 Levante Beach Hotel is located just 60 meters from the black sand beach of Kamari in Santorini, and features a swimming pool with sun terrace. 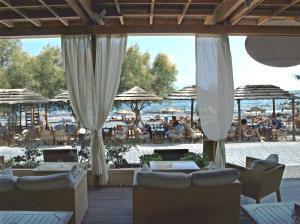 It also offers a buffet breakfast and has a restaurant with a cocktail bar. Room overlooking the town of Pyrgos or the hotel garden. 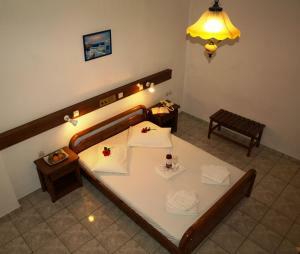 Room with a balcony overlooking the town of Pyrgos or the hotel garden, air conditioning and satellite TV. Room consisting of 2 connecting rooms. Smaller than usual room with views of the garden or parking area. Room on the 1 floor with private balcony overlooking the pool and partial sea views. Includes air conditioning and satellite TV.